WHILE royal watchers have settled outside Lindo Wing at St Mary's Hospital waiting for the birth of William and Kate's third child, there's the political watchers back in Australia waiting for another highly-anticipated birth. The love child of Barnaby Joyce and his partner Vikki Campion is now due any day. This will be the fifth child for Mr Joyce, and his first son, but the first baby for Ms Campion. And to put any doubt aside, this is Mr Joyce's baby. His raising questions this year about the paternity of the baby was a befuddled and bizarre attempt to criticise the media's reporting of his affair, marriage breakdown and claims of special deals for his girlfriend. 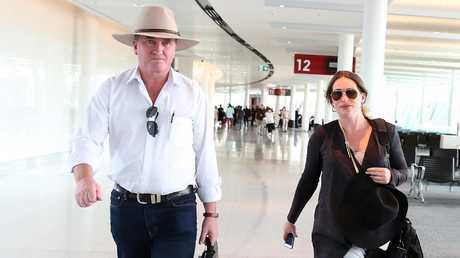 Mr Joyce, who is still married but separated from his first wife, Natalie, is understood about a month ago over beers with some mates to have acknowledged he made a mistake when he claimed the baby's paternity was "a bit of a grey area". Mr Joyce knows the baby is his. He is said to be blissfully happy and in love with Ms Campion, his former staff member, but he remains resentful over how he's been treated by some members of the Coalition. Many in Parliament are waiting with bated breath to see how Mr Joyce will deal with the new edition. Some hope he avoids a circus by releasing pictures of the happy family on social media. That is the preferred option for some in Government. Most agree doing a photoshoot with a women's magazine - and being paid for the pictures and interview - would be a bad look, and will invariably spark some in the Canberra Press Gallery to ask Malcolm Turnbull whether Mr Joyce should profit from the controversy. If he does neither, the new family faces being hounded by the media. His plans are not being shared with Mr Turnbull. There are irreconcilable differences between the former deputy prime minister and Malcolm Turnbull. Mr Joyce feels hurt that after sticking by the PM and publicly backing him and his leadership, that Mr Turnbull was so cutting in his remarks about the then Nationals' leader's affair with Ms Campion. Mr Turnbull, guided by his wife Lucy, announced a bonking ban between ministers and staff after the drama was played out while Parliament was sitting. Some senior members of the Government tried to talk Mr Turnbull out of his plan and privately concede the idea was dumb, and that Mr Turnbull's remarks were too judgmental. But what does the arrival of the bouncing bub mean for the Government and Mr Joyce? There will be momentarily disruption for the Government. If Mr Turnbull plans to make significant announcements, there are likely to come second to Barnaby's bub. Mr Turnbull will be on the world stage for about 10 days from tonight, as he attends the Commonwealth Heads of Government Meeting in London, where he has a series of important meetings with world leaders. He needs the media focused on him. But he will be asked questions- from the legitimate to the ridiculous. Expect Mr Turnbull to be asked if he has rung Mr Joyce to congratulate him, whether Mr Joyce has returned his call, whether he has bought a gift for the baby, whether Mr Joyce should take paternity leave. The man who replaced Mr Joyce as deputy prime minister, Michael McCormack, is likely to be Acting Prime Minister when the bub arrives. While much of the sting has gone out of the issue because Mr Joyce resigned as deputy PM during the fiasco, there will be some reigniting of matters that have yet to be settled. Western Australia woman Catherine Marriott made a sexual misconduct complaint against Mr Joyce - the outcome is still not known. Mr McCormack will face the domestic media firestorm but the political heartburn won't last for long. Some within Government hope the baby will calm Mr Joyce and zap his bitterness. They hope this for two reasons. Mr Joyce is now out of the Cabinet tent and can publicly disagree with the Government as much as he likes. Some in Government believe it was Mr Joyce who leaked the story to The Australian that Home Affairs Minister Peter Dutton wanted to reduce immigration intakes - a position not supported by the PM or Treasurer Scott Morrison. He also, unhelpfully for Mr Turnbull, suggested the Prime Minister should reconsider his position as leader if he does not turn around his standing in the polls - something he did not need to hear after losing 30 Newspolls in a row last week. Secondly, many realise Mr Joyce will be a formidable campaigner at the next election.